Brownstone boutique chic: Zoë van de Wiele and Cloth, five years in on Fort Greene Place. It’s been five years since the designer emporium Cloth debuted in a brownstone on a quiet side street — Fort Greene Place, off Hanson. Back then, compared to the longstanding boutiques on Fulton Street, Cloth was the upscale newcomer. But with little fanfare, owner Zoë van de Wiele has built up a clientele and a reputation as the woman to see for stylish duds that won’t break the bank. That small selection includes offerings by American Vintage, a French dress company, New Scotland, Utility Canvass, Cotélac and Stewart Brown. Denim, metallic colored sneakers and jewelry are also on hand. “Everybody always likes dresses,” said Ms. van de Wiele, 43. “The most expensive dress I have is about $250. Generally I try to keep them under $200 if I can.” Cloth’s clients, Ms. van de Wiele said, are primarily Fort Greene women who juggle work and motherhood. Before Ms. van de Wiele became a mother and moved to Fort Greene to raise her family, she designed cycling apparel for women, she said. That line, Psoas, was manufactured for a time on Dean Street; it stopped production in 2000, before Cloth was born. 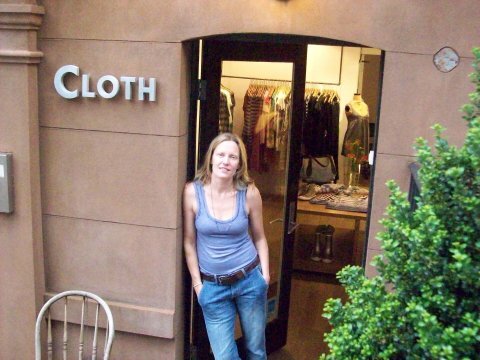 Cloth is located at 138 Fort Greene Place. Longtime residents will remember it as the old location for the restaurant Under the Clock. Years before, it was an Irish pub with a bit of a reputation.